Chess is a frequent subject in paintings. The splendor of chess in artistic perspective is reflected in the fact that an artist has rendered on the canvas the intellectual depths of the game. That chess has been a subject matter in paintings is an attainment in terms of its value getting wider recognition. Chess players, people watching chess games, chess pieces and other themes have been portrayed in different types of paintings. But there is also the “painting of chess”. Without going into a discussion of what abstract painting is and different kinds of abstract painting, in my opinion the painting of chess should be a subject of abstract painting. Is it fair to say, then, a painting with chess as subject matter is a painting of chess, telling about chess. Paul Ygartua is an artist whose versatility is reflected in his work. He is among those who lives elsewhere than their birthplaces. He was born in 1945 in Bebington, in the suburbs of Liverpool, England. After graduating from Faculty of Arts Industrial Design, Liverpool University in 1966, he immigrated to Vancouver, Canada. From then on painting becomes his whole existence. He calls Vancouver, the place he lives in when he is not traveling, his home. He has become well-known in Canada especially for his enormous murals. 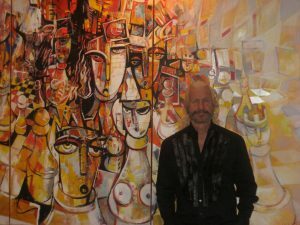 In time his status as a world artist is recognized with awards, his work finds place in art collections. He says, “For me the Game of Chess is like the Game of life.” Familiar, though, the simile of “game of life” is, perhaps, Ygartua is the first to use it as such. It is a word that belauds neither life nor chess and meets them both within the construction of play. Just before his above mentioned definition, Ygartua mentions that after the first years chess was first played, it became loaded with social meanings, with chess playing becoming an indicator of nobility and a source of prestige. He certainly states that it is a value associated with the Middle Ages. It is obvious that today chess has become a unifying element, also as a subject of artistic work, for the whole of humanity. Ygartua says, “The objective is to win, but the challenge is designing and then acting out a strategy to achieve that goal–as in life, you must constantly evaluate and change your playing strategy.” here he underlines the significance of methods in order to win. Although winning appears to be the end aim, it emerges as a means to the end, as a signifier. Only as a result of this correct approach doe winning become an aim. Obviously we cannot forge relationships in terms of “winning”, in any issue. We can do something in terms of method or approach, for strengthening our struggling power. I will make an inference using three examples from Ygartua’s work. It is the beginning of the game. The singular is pronounced. The pieces are in place. Pieces have formal values at the beginning of a game of chess: Queen is worth 8 points, rook 5 points, knight and bishop 3 points each, and pawn 1 point. The pieces are ready to change from one plane to another. The journey begins. We have come to the middle game. The singular is enmeshed within the whole. The pieces are less pronounced. Bit by bit we sink deeper into the game, that is, reality, and pieces start to lose their “relative” value. They become images in our minds in proportion with their position on the board and relevant influence. It is now the end game, and the pieces are almost nonexistent. Their meaning lies in their interaction and they find echoes in our minds to the extent of their significance within the whole of the position. The pawn is not even worth 20 points. Or maybe it is worth everything. The queen is null. What is significant is the content as a whole, which is as it is reflected in our minds. The subject is freed from its apparent “arbitrary” nature, as in abstract paintings, devoid of its “random” nature at the outset. The game is not over but the construct has completed. For what it’s worth in terms of stepping back for understanding, this construct is a new beginning. All these evaluations are mine and thus subjective. Whether objectivity exists, there is no way to tell. We can think about what is more objective, and arrive at it, too. What about the absolute “objective”? Some say it exists, others say there is no such thing. We may be tempted to ask, “what about the opinions of the artist?” Also valid is the question concerning whether the artist is in anyway related to his work once he shares it, turns the act of “thinking” to “thoughts”. Or is it now the case that the only reality is the subjectivity in the minds of members of the audience? What get us closer to objectivity, interaction between subjective viewpoints, just like singular pieces forming the whole on the chessboard?